current page Why are we campaigning for specialist MS care? Why are we campaigning for specialist MS care? There are over 100,000 people living with MS in the UK today. But MS Trust research shows that there is a shortage of MS specialist nurses and an urgent need to raise the profile of the physiotherapists and occupational therapists with special expertise in MS. Amy Bowen, Director of Service Development at the MS Trust, explains why we’re working to put MS specialists at the heart of MS care and why we need your support. People with MS are most often diagnosed in their 20s and 30s. In fact, MS is now the most common neurological condition affecting young adults. So MS really is a lifelong condition. If you have MS you may have to make some big adjustments, manage a range of symptoms, make difficult decisions about treatments and face an unpredictable future. Despite the number of people who are living with MS, understanding of the condition among health professionals is still often limited. Many health professionals will not have had much experience of MS and don’t have the up-to-date knowledge of the latest developments in MS care. There are new treatments for MS and its symptoms and our understanding of the condition is constantly increasing. This is why MS specialists – neurologists, nurses, and physiotherapists and occupational therapists with special expertise in MS – are vital. They have knowledge and experience to provide the expert, personal support people with MS need, across the range of symptoms, throughout their life with MS. It takes training, knowledge and experience to become a specialist. Not all specialists will have the word in their job title, but the MS Trust works closely with the key professional groups like the UK MS Specialist Nurse Association and the Therapists in MS group to help define what it means to be a specialist. For more than 10 years, we have been providing training programmes for every UK MS specialist nurse as well as for physiotherapists and occupational therapists. This has helped to develop an MS specialist workforce and to help to let us know where are gaps in availability of these specialist roles. National experts work with us to deliver the training programmes in order to make sure that the best possible care is available as widely as possible. Along with training, the amount of time health professionals spend working with people with MS is also critical. There is no substitute for building up experience in the many symptoms of MS and the treatments, both the drugs and the therapies. Part of what defines a specialist is that bank of experience that they can draw on to provide the right information, advice and care for each person’s unique circumstances. However, not everyone with MS in the UK has access to the MS specialist care they need. MS Trust research has identified a shortage of MS nurses and many of them have caseloads that are more than twice the number that is practical or sustainable. Physiotherapists and occupational therapists with special expertise in MS are in limited supply and our research has shown that there is an urgent need to highlight the importance of their value. 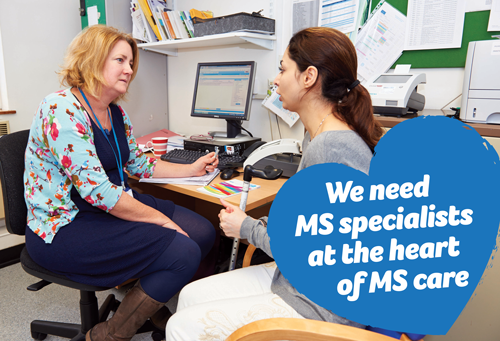 Managers and commissioners in a cash-strapped NHS need to know that the knowledge and experience of MS specialists can have a huge impact on the lives of people with MS and to ensure that there are enough of these specialist health professionals to meet the needs of their local community. For people with MS, access to MS specialists means having support to feel in control of the many symptoms of MS. It means being prepared for potential problems or changes and knowing how to prevent crises. It means being able to receive the expert support to recover from set-backs and to adapt to new circumstances. MS specialists have the knowledge and experience to help with staying in work, staying active and making choices about care and treatment that suit each person’s unique circumstances. By working to improve access to MS specialists, we can help to ensure that everyone with MS gets more of the care they need. Having enough MS specialists also help raise awareness and improve understanding of MS amongst health professionals who have less experience of MS.
MS specialists don’t work in isolation. As well as being part of specialist teams which include neurologists based in hospitals, they link up with GPs, district nurses and other local services and share their knowledge and expertise to help coordinate and improve the whole experience of MS care. This all helps to avoid emergencies and reduce the need for already over-stretched A&E departments. The MS Trust is committed to making sure that everyone in the uk affected by MS can get the best possible care. But we need your help to continue our work. Through our innovative national GEMSS programme, we’re working with MS specialists and developing new tools to help them show managers and commissioners how they offer the best, most effective care for people living with MS. As part of GEMSS, we are running a national survey service and are gathering the views of thousands of people with MS about how specialist care makes a difference to them. 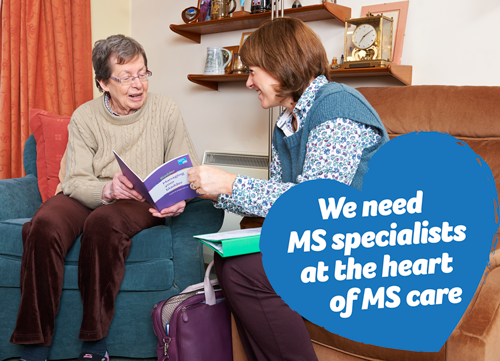 By supporting our campaign, you’re helping us to make the case for specialist MS care. We train every new MS specialist nurse in the UK, making sure they can deliver the best possible care for everyone affected by MS and we offer a full range of training and support for physiotherapists and occupational therapists to gain expertise in MS. We also provide additional training as well as support and resources to make make sure all MS specialists stay up to date with the latest developments. By supporting our campaign, you can make sure we can continue this work. We are disappointed that the new national Guideline for MS doesn’t go far enough in highlighting the importance of MS specialists. We want NICE, the national body that provides guidance to improve health and social care, to recognise the importance of MS specialist nurses as well as physiotherapists and occupational therapists with special expertise in MS. We want to raise the profile of these roles, help build the evidence for their value and to get NICE to acknowledge the difference that their services make. By signing up to our campaign, you’re adding your voice to this call.